Native Indians had inhabited the Nevada landscape for years before any Europeans arrived. Groups like the Yomba, Te-Moak, Pauite and Shoshone tribes lived on the lands. The Spanish missionary, Francisco Hermenegildo Tomás Garcés, coverage much of the southwestern region including Nevada. An American, Jedediah Smith traveled much of the southwest in the 1820s. His explorations into the Las Vegas Valley in 1827 were significant in opening the American West to expansion by white settlers. The United States gained the Nevada area from Mexico in 1848. Yet, Mexico had never established any control in Nevada. It was the American mountain men and then in 1851 the Mormons who set up way stations en route to the California gold fields that helped settle the area. By 1858 only a small number of Mormon settlements were along the Utah border barely sustaining their communities. For Nevada genealogy, it was the great silver strikes beginning in 1858 that created the Nevada boom towns and fabulous fortunes. In 1860, Nevada had about 6,850 people. Statehood was granted in September 1864. By 1870 the population had soared to nearly 43,000. The increase was due to the Comstock Lobes discovery of silver in Nevada. This attracted thousands of miners, most from California. There was an expansion of the state’s southern boundary in 1867 prompted by the discovery of gold in the area. The discovery of silver and gold in 1900 near Tonopah set off another boom period. Each time, more and more emigrants headed for Nevada. One of the big mining towns in northern Nevada was Golcanda which was built when copper, silver, gold and lead was located. Thousands of entrepreneurs who opened mines and mills in the district, hired more workers. Looking at Nevada genealogy, it is noted that the settlers coming to live and work in Golconda were native-born Americans, French, Portuguese, Chinese and other people. Over 80 percent of the Nevada area was owned by the federal government. The early settlers would homestead the land surrounding a water source, and then graze cattle on the adjacent public land. After 1900, groups of Slavic, Italian, and Basque Catholics moved to the state. By 1940 the state’s population was 110,000, then in 1970 it was 488,700 residents. The biggest surge has come in the late part of the 20th century. 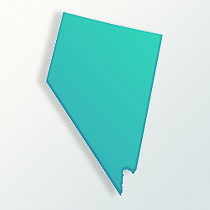 In 2009, Nevada has about 2.6 million people. The Chinese came because of the mining in the 1800s and the Japanese for farming. In the 20th century, thousands from Korea, Philippines, Taiwan, India and Vietnam have settled in the state, making Nevada have a high concentration of Asian-American communities. Overall, the white population is 84 percent and the African-American percentage is 8.5. The Hispanic population is represents about 22 percent of all of Nevada.